Crestwood Middle School sixth-grader-turned-builder Roshan Kami and his business partner classmates scrambled when their clients said they wanted an already-installed window moved from the east side to the west side of their new house. 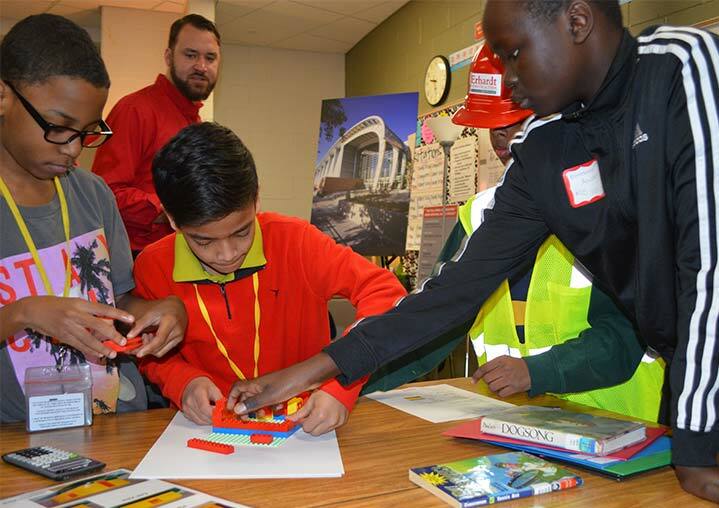 The activity was part of Crestwood’s sixth grade Career Fair, during which 120 students explored construction, healthcare, information technologies and aviation with local professionals. The goal was to get them thinking about careers and what to do to prepare for them, said Nancy McKenzie, Kentwood Public Schools STEM coordinator. Students met an airline pilot and mechanic, an IT consultant, health-care professionals and the construction company representatives. Bethany Capra, marketing specialist for Erhardt, said taking part was a chance to let students know potentials in the industry and the careers that await them. 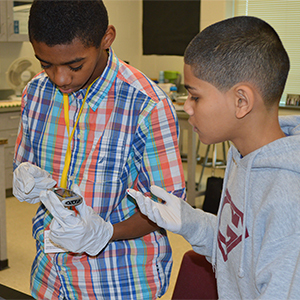 Carolyn Blake, Kent ISD’s Health Sciences Early College Academy diagnostics instructor, taught students blood-typing (with fake blood), glucose testing and phlebotomy. Health care is another in-demand industry. Sixth-grader Hana Kamber said she wants to be a doctor, and was happy to learn how testing works. “You might be in an emergency and need to be prepared,” she said. Crestwood Principal Omar Bakri said the main thing that determines whether a child will be successful is motivation, and exposing them to possibilities is the key. McKenzie plans to follow up with a visit from high school counselors to talk about how students can plan classes aimed at career pathways and a trip to a college campus. “We want them to get a broad picture of what high school might look like through a counselor’s eyes, and looking at a college and then backing that up with what they’ve seen today,” she said.